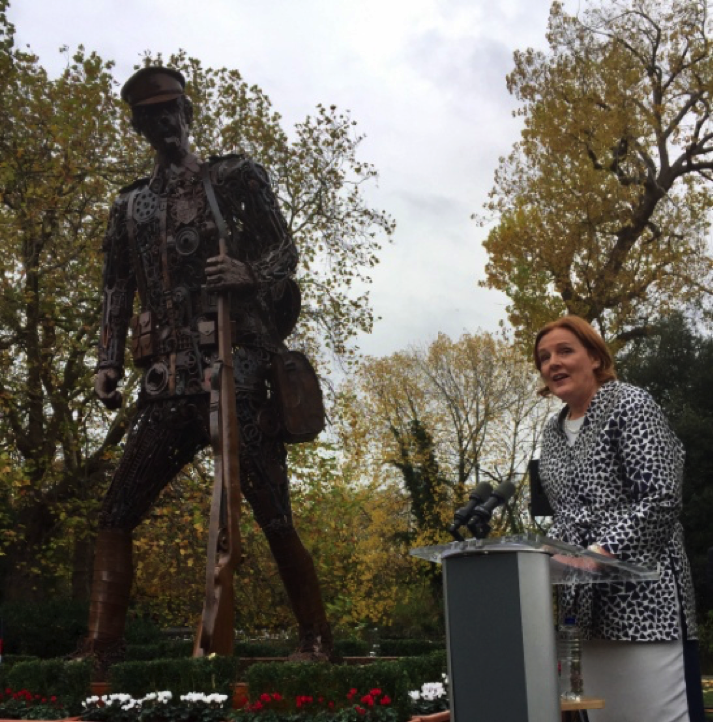 Under the auspices of Sabina Purcell – Ireland’s World War 1 Veterans’ Project, a civic welcoming ceremony took place on 04 November, in St Stephen’s Green, on the arrival of the Haunting Soldier in Dublin, marking the centenary of the end of the First World War. The sculpture will return to Dorset on 26 November. 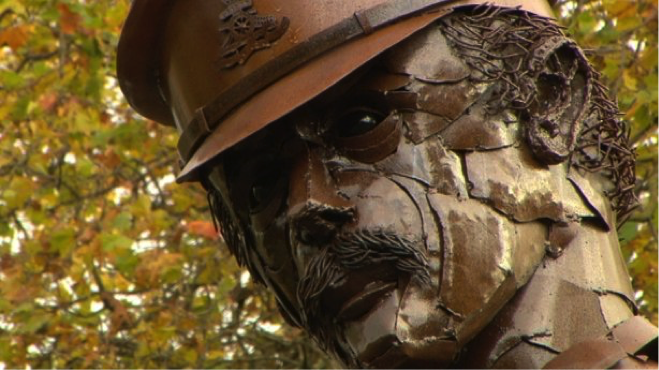 The Haunting Soldier, which is 6 meters in height, is made entirely of tin scrap metal. The sculpture was created by Slovakian artist Martin Galbravy and constructed by Chris Hannam at Dorset Forge and Fabrication. The sculpture evokes the fragility and suffering of those who survived World War I and returned home to an uncertain and difficult future. The sculpture represents a soldier returned from war, battle weary and forlorn. The ribbon was cut by Mr Peter Gordon on behalf of the relatives of those who died during the war. The Minister for Culture, Heritage and the Gaeltacht, Josepha Madigan T.D. represented the Government at the ceremony. Speakers included Minister Madigan, Ms Sabina Purcell, Ms Jo Oliver writer and owner of the sculpture, Mr Stephen Dury St John’s Ambulance, and Mr Kingsley Dolandson Northern Ireland WW1 Centenary Committee. Music was provided by Mr Liam Ó’ Maoniaí and St Mary’s College Singers. The Department of Culture, Heritage and the Gaeltacht and the Office of Public Works supported this project under the Decade of Centenaries commemorative programme. The sponsorship received from AIG insurance John Sisk & Son, Nolan Transport, CSM construction, KMP and Ms Jo Oliver provided was pivotal to the success of the project. During this Decade of Centenaries, we have shone a light, in many cases for the first time, on the stories of the men and women, from the island of Ireland, who served and sacrificed their lives in World War I. We have explored, with respect and compassion, the differing motivations of those who fought – many driven by complex ideals and aspirations and others driven by economic necessity. The horrors of the battlefield left deep and lasting scars on those who survived, traumas which were often compounded by their difficult experiences on returning home. As we approach the centenary of the signing of the Armistice that ended the fighting in World War I, I am delighted to support creative endeavours such as this that provide opportunities for people of all ages to consider the sensitive legacies of our past with understanding, empathy and a spirit of mutual respect and kindness. As we reflect upon the complex narratives surrounding Ireland’s participation in World War I, we are reminded of our shared history and common humanity.